The Mental Traveler is a lost-then-found manuscript of 20th-century American poetry that was completed in 1990, but remained unpublished. 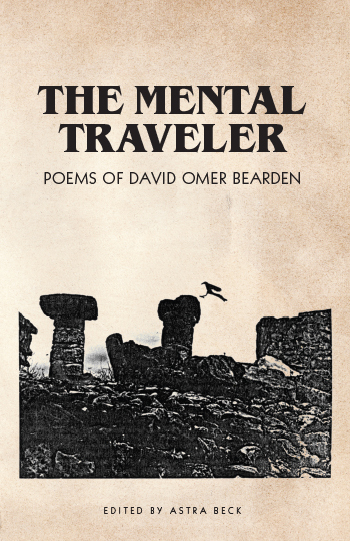 Now released for the first time, The Mental Traveler reveals a notable range of David Omer Bearden’s work, starting with his formative years in 1958 while attending the University of Tulsa. The Mental Traveler's theme pays homage to William Blake's out-worldly poem The Mental Traveller with great respect. As we digest Bearden's work, we realize that he not only embodies and mirrors the concepts of Blakes poem he becomes an entity all of his own. The Mental Traveler has an autobiographical component to it that takes you on a journey from when he was born in 1940 up to 1990; sharing his personal life about love, friendship, family, joy, grief, suffering, and redemption. Bearden's poetry takes your headspace into higher frequencies that challenge the common terrestrial ideas; where the mundane becomes miraculous. The ordinary becomes holy and shifts your consciousness out of the conventional humdrum. His unique brand of personal folklore and wordsmithing as well as creating his own (Beardenisms) language, demands the reader to redefine their prescriptions of literary normality. David Omer Bearden is the surviving brother of twins born in the Sonoran Desert of Blythe, California in 1940. David dedicated his creative life to writing poetry, starting from the post-Beat era, until he passed away in 2008 in Scranton, Pennsylvania. He was a widely-traveled poet and musician who possessed intelligent wit and biting insight. His character and literary work were respectfully admired by colleagues such as Ted Berrigan, Neal Cassady, Ken Kesey, Steven Lieper, Daniel Abdal-Hayy Moore, Maureen Owen, Ron Padgett, Charles Plymell, Roxie Powell, Alan Russo, and singer/songwriter Judee Sill*, with whom Bearden shared a deep and poetic romance. He is also known as the "Apocalypse Rose." * Special Note: The Mental Traveler includes an intimate joint diary between David Bearden and Judee Sill while they were on tour in England, 1973.